A long time has passed since the war which engulfed the whole of Murgenia. Yet the precariously maintained balance of peace approaches its end. Zarmine, a large kingdom located in the northern part of the continent has been reborn with the coming of its new king. Unsatisfied with the small power he wields, the desire for conquest consumes him. Under orders from this king who knows no equal, the Dark Army begins its invasion, turning many countries to the flames of war. Among those preparing for invasion is a small country located to the south west of the continent, known as Sunkwoll. The military strength is not even one tenth that of a large country. The will of the soldiers shakes. The king pours out lavish luxuries upon the nobility, without regard to the welfare of his people. It seems as though the destruction of this small, weak country Sunkwoll is imminent. Why? 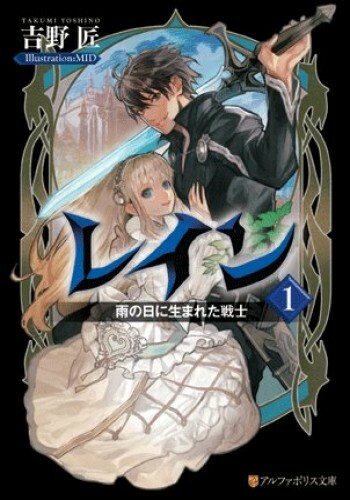 : Would be nice to see something other than Isekai, the good old high fantasy. Yeah, Rain sounds like an interesting straightforward fantasy that would become a great addition to JNC's library but it would likely have higher chances if it had a trashy schoolboy isekai trope. And wasn't published by Alphapolis. The author of this series, Yoshino Takumi, has passed away. Always sad to hear when the world loses a voice...R.I.P.